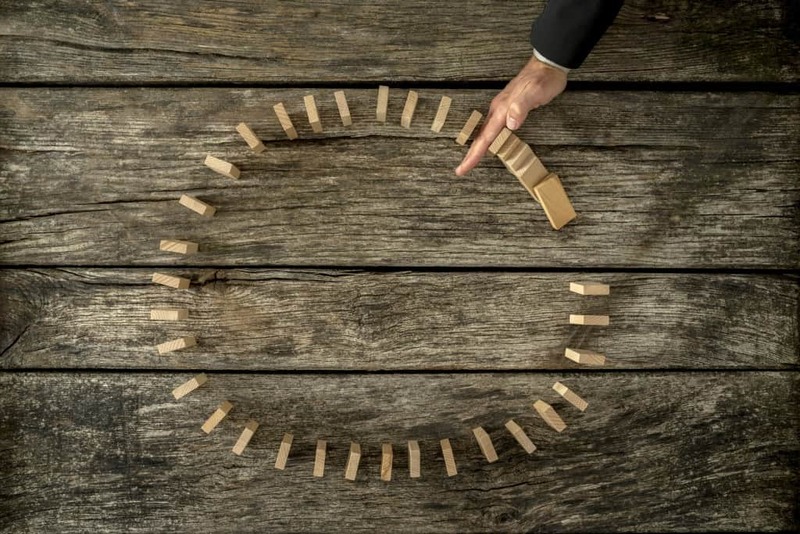 A good crisis management process will help identify threats to an organisation, its stakeholders and customers as well as providing structure to deal with a crisis when it does occur. Managing a crisis effectively will help ensure that any damage to an organisation is limited and that in post crisis the business can develop and grow. 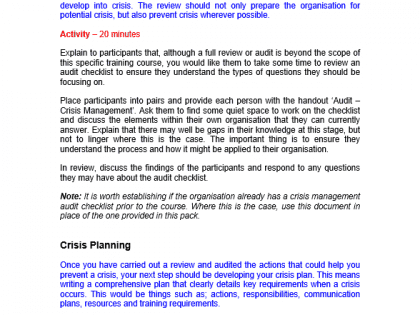 These crisis management training course materials are designed for anyone that might have to deal with or be prepared for a crisis within their organisation. This could mean members of the crisis management team or simply managers within the organisation that should have a strong awareness of the process and requirements for dealing with a crisis. Limit the risk and manage the damage with these crisis management training course materials. A crisis is defined as any situation that threatens to harm a person or property, disrupt business, negatively impact an organisation or damage its reputation. The role of crisis management is to help manage these situations when they occur, or where possible, avoid them happening altogether. Perhaps you are looking to implement a crisis management process, or you want to upskill your workforce in the process you already have. You may even need to refresh the skills and thinking of the managers within your organisation. Whatever your need, Trainer Bubble provides you with a comprehensive crisis management training course to make your life easy. 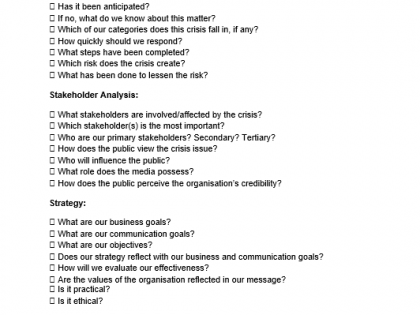 Why is running this crisis management training course a good idea? Identify the crisis vulnerability of your organisation. Put measures in place to limit the chance of a crisis occurring. Create a clear strategy for dealing with crisis when it happens. Improve their understanding of the impact of a crisis and how to mitigate it. Communicate with key stakeholders quickly and efficiently, to ensure damage limitation. Manage the relationship with customers and the media effectively. 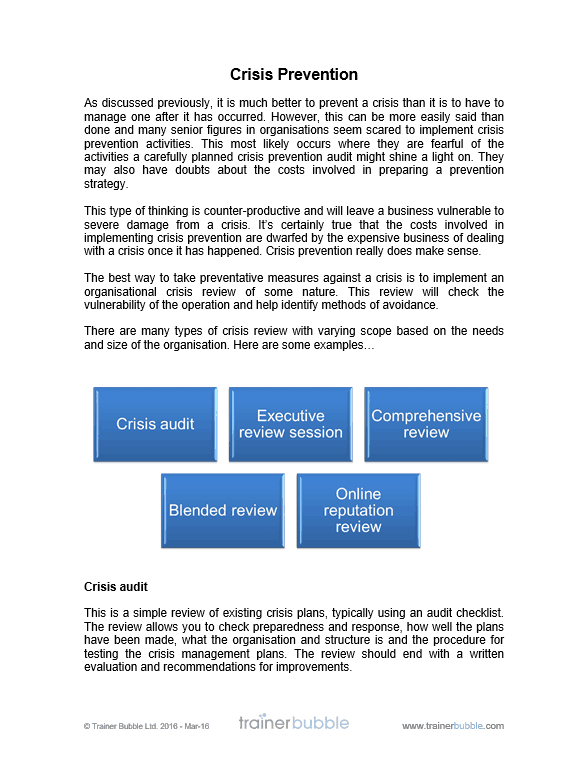 Ultimately these crisis management training course materials allow you to develop procedures and plans that leave your organisation better able to cope with crisis and potentially avoid them all together. 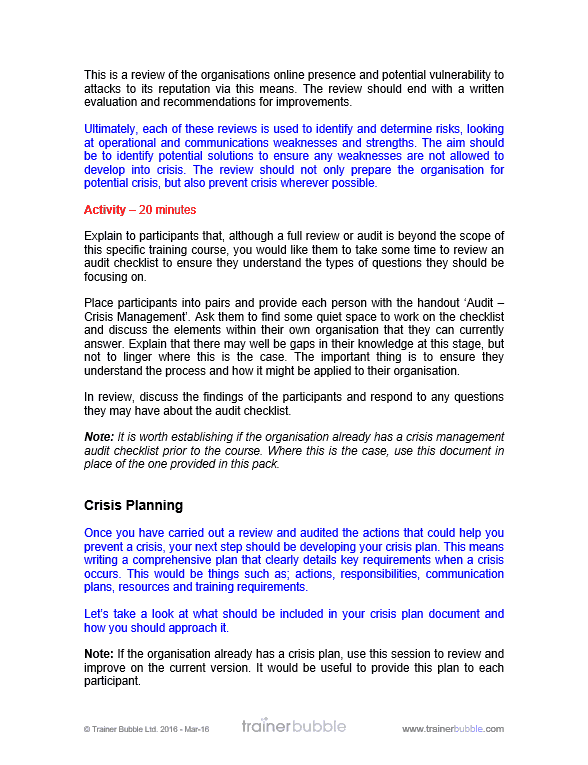 These crisis management training course materials will provide your participants with the skills and knowledge needed to deal with crisis when they occur. They look at methods of planning for crisis management; anticipating and avoiding crisis wherever possible, whilst helping them manage the organisations reputation both online and in the more traditional sense. 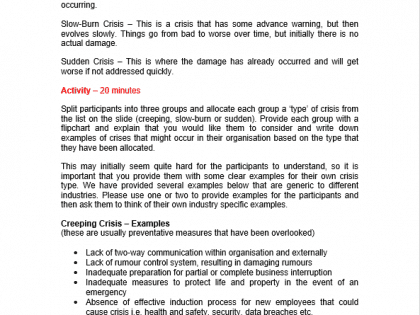 Types of Crisis – An examination of the types of crisis that can befall an organisation with an activity that begins to identify the crisis that could be specific to the participant’s organisation. This is an excellent starting point to help participants understand the potential for crisis within their organisation and what vulnerabilities there are. Stakeholder Identification & Analysis – Crisis management is all about keeping stakeholders informed and engaged while mitigating the impact of the crisis on them. This session helps identify who the stakeholders are, how they need to be kept informed during a crisis and mapping the relationship. 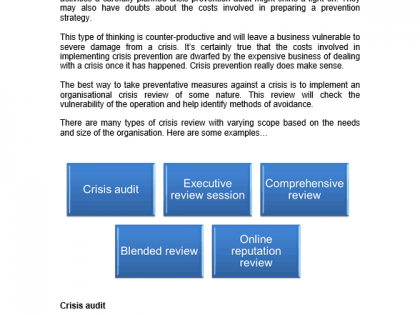 Crisis Prevention – The best way to manage a crisis is to avoid it altogether. This section covers the different audit reviews an organisation should make. It also provides a structured audit review checklist document and allows the participants to practice its use. Where an audit review document already exists, the participants will be encouraged to review their own version. 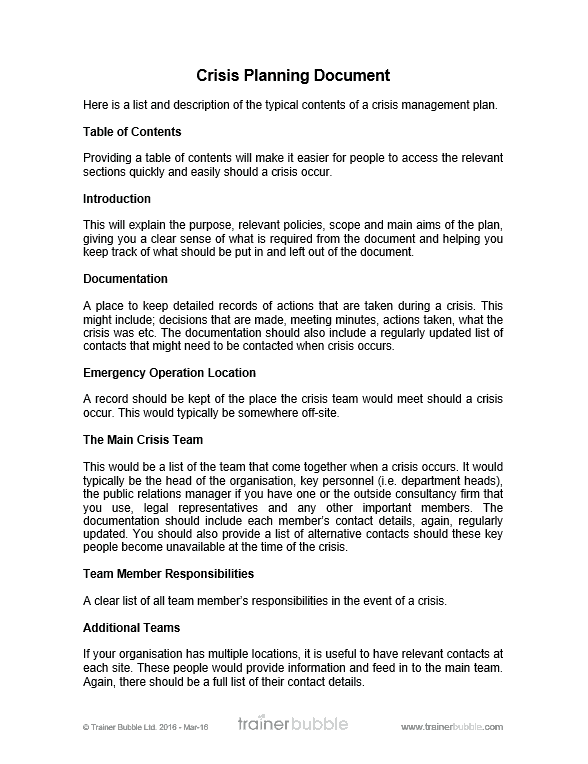 Crisis Planning – Participants are provided with a structured list of the contents of a full crisis planning document, which explains each requirement, what should be included and why. They are also tested on this knowledge through key questions aimed at their understanding. 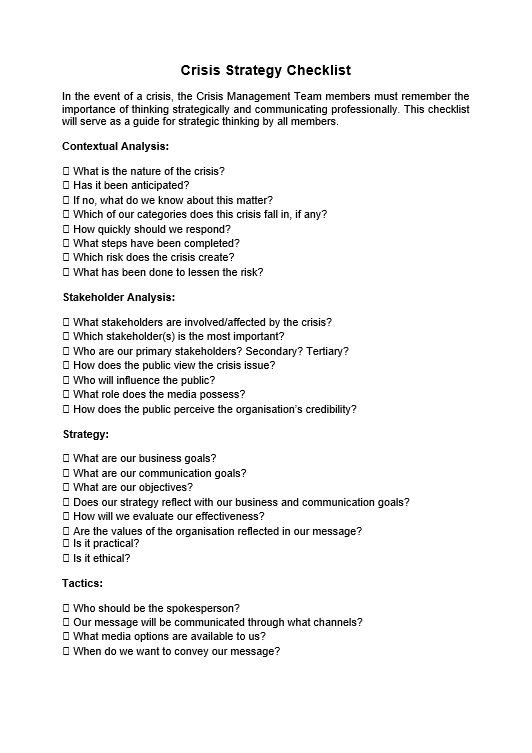 Crisis Strategy Checklist – This is a key document that should be included in with the crisis planning documentation. We provide this and review how to use it and what the benefits are. 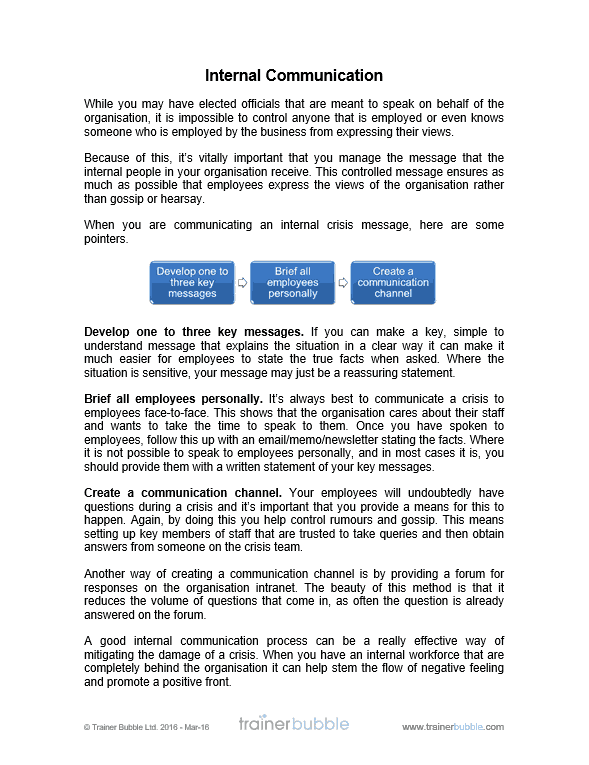 Crisis Response – When crisis occurs, it’s imperative that employees know how to respond. This session looks at the key elements to an effective crisis response. 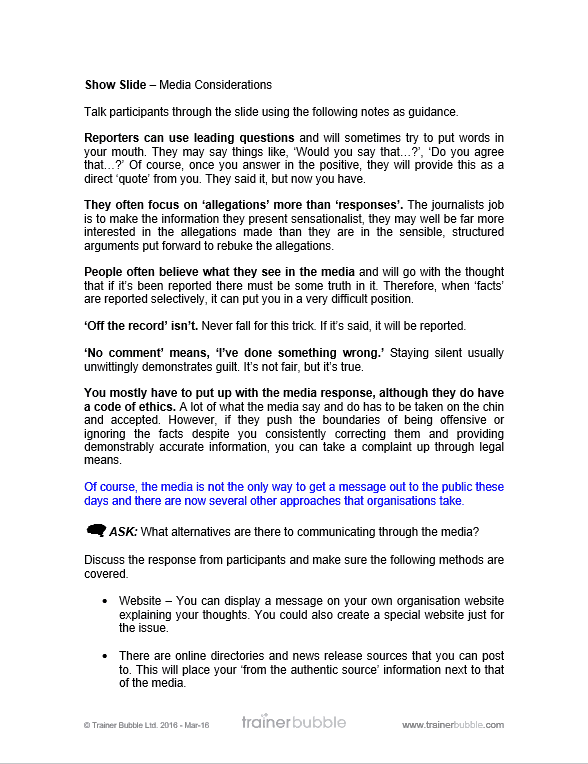 Demonstrating Credibility – Using a simple process to identify what to say and how to say it. 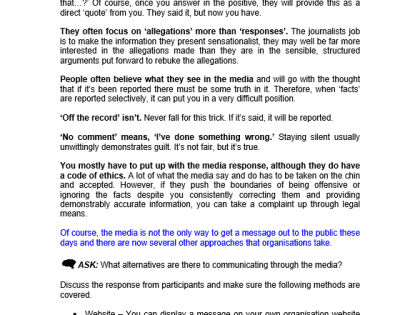 Dealing with the Media – A key set of considerations to make when dealing with the media and a review of the alternatives to talking to the media. 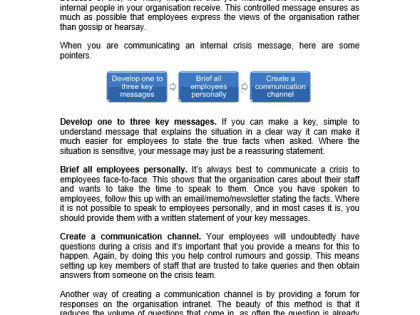 Internal Communication – A key element that is often overlooked. Employees are a key stakeholder and should be kept informed during a crisis. Here we explain how. 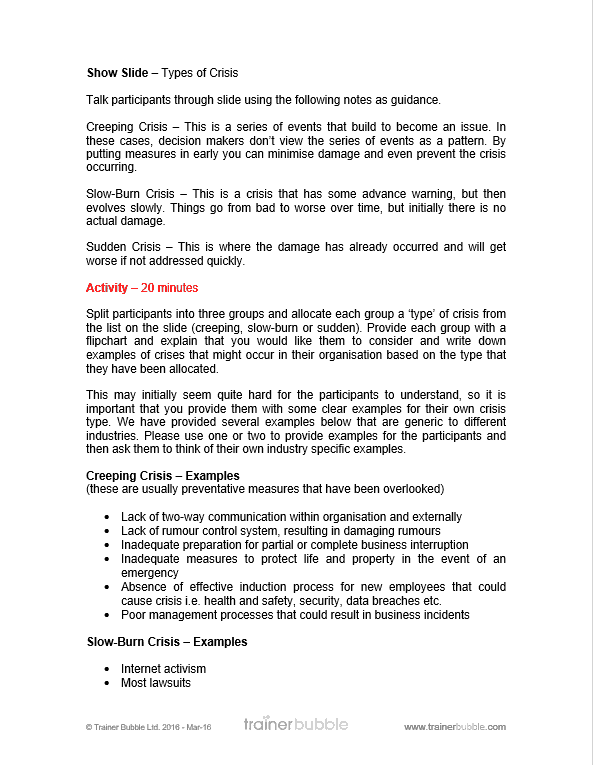 Creating a Crisis Message – Providing a full description of the methodology behind formulating a crisis message, followed by a chance to create their own crisis message and review its effectiveness. Crisis Recovery – What to do after the crisis has abated. Identifying the damage, knowing what steps to take next and taking a post-crisis review. This document is provided and participants get the chance to review and practice with this. Online Reputation Management – Managing damaging information provided over the internet, dealing with social media and its influence and managing online threats to your organisation. 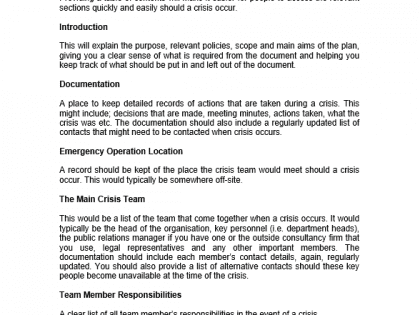 Crisis Practice – Case Study – Bringing all the skills together in an exploration of the crisis management process through the eyes of an organisation that went through this. A chance for participants to test their knowledge, consider their approach and practice ideas in a safe environment.